The city of Zurich has 110 bikes for city employees to use for business-related trips. Full-maintenance, and easy access to the attractive bikes makes them popular with city staff. The project was recently upgraded, new bikes bought, and is ongoing in 2009. In city traffic bikes are the most efficient and quickest way to cover short distances. Some departments in Zurich have had company bikes for several years, but they were poorly maintained or difficult to use. So the city council decided to centralize the purchase, maintenance & coordination of the bikes. Attractive bikes. The company bikes, in the city colors of blue & white give an attractive public image. It is a comfortable city bike with 8 gears, developed specially for the city of Zurich. The wide tires give good suspension and help avoid accidents in tram rails. Lights come on automatically in the dark. Employees were involved in the evaluation phase with test rides. Easy access for a quick start. Past experience showed the harder it is to get access to a bike, the less they are used.>Therefore the company bikes for the City of Zurich are available for business-related trps, without any reservation or registration. The parking facility was custom built and can be opened with the standard personal office key. One of the most important aspects is the maintenance. Bikes are inspected regularly and repaired as needed to guarantee road-worthiness; Tachometers on every bike allow usage to be statistically evaluated. If there is a problem with the bike underway, the “bike doctor” can be called. The telephone number appears on the bike frame. The bike is picked up, repaired and returned to its place. Up to 90% of employees polled gave a positive feedback evaluation. This resulted in purchase of more bikes. In 2007 there were 110 Zurich city “company-bikes” rolling through the streets. Perhaps they motivate some employees to use their own bikes more often, which also has positive health benefits. Update: In 2011, the bike number almost doubled and now stands at about 200 bikes. 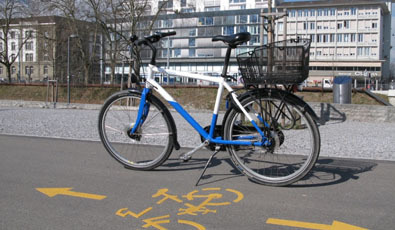 The project intends to order new bikes in 2012 and integrate e-bikes into the fleet as well. Maintenance of bikes is now done with an e-bike rather than a van, and bikes travel on average 30 kilometers per year, per bike.